Maybe in the next update, you can also subtract friendship points from the spouse and children for having an unlit fireplace in the winter. It's already an awesome mod to have as it is, thank you! Thank you for this idea (and the kind words). I implemented this and now the spouse also complains if the fire wasn't lit. The dialogue message dependents on the amount of children you have. Since I don't have children and no Spouse in my current game, I could only do some basic testing. Please let me know if there are any issues. Funny thing is, I'm on a new playthrough myself, so it'll be a little while before I can test it out. I'll absolutely report back once I get to that point though! Thanks for the speedy update, that's amazing! Hello. This is a good mod for survival purposes. 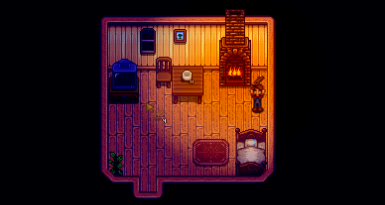 I would like to suggest having benefits if the fireplace is lit, like a slight stamina regeneration. But for now I have a reason to use the fireplace. Thank you! There are some. I use EatMore (https://www.nexusmods.com/stardewvalley/mods/2724) and it fits really well into the game. Sadly its overwrites the stamina value of this mod.